Fifty years ago, the Earth was annually losing forests the size of England. Today, the world loses 14 hectares of tropical forest every minute, mostly due to agriculture to support growing populations and fuelwood for cooking fires. Yes, fuelwood is now a culprit in deforestation. In Africa, Asia, South America—continents where large populations rely heavily on fuelwood for cooking—women, and children who bear the burden of looking for fuelwood, are walking longer hours just to search or cut trees for firewood. Almost 2 billion rural people in developing countries do not have enough wood to cook their meals. Their number will grow to 2.5 billion by 2025. Fuelwood supply and demand are coursed through head loads, camel trains, donkey and bullock carts, bicycles and shoulder loads. Ultimately, fuelwood ends up in cooking fires. So says Earthscan, a London-based information think tank on environment issues citing United Nations Sustainable Report “Understanding Fuelwood” by Phil Barry Munslow and Phil Okeefe. “The fuelwood problem has been isolated as an ‘energy crisis’ issue. Interventions to date have concentrated on narrowly defined technical options for supply enhancement or demand constraint. But there has been a failure to understand the fuelwood problem correctly,” it said. “And unless developing nations adopt a serious and a no-nonsense approach to save its forests and woodlands, fuelwood will be the most serious energy crisis for the next 50 years,” it warned. The UN Food and Agriculture Organization (UNFAO) figures show that from 2000 to 2004, Southeast Asian countries have been using more wood for cooking with Cambodia, Lao PDR, Indonesia, Malaysia and the Philippines as the top users, followed by Myanmar, Thailand, and Vietnam. Forest loss is acute in these countries, the second of the world’s great biodiversity hotspots. According to the 2005 report conducted by the UNFAO, Vietnam has the second-highest rate of deforestation of primary forests in the world. More than 90 percent of the old-growth rainforests of the Philippines have been cut. Other Southeast Asian countries where major deforestation is ongoing are Cambodia, Indonesia, and Lao PDR. Their combined fuelwood use is responsible for the deforestation of 72 percent of forests in the five-year span. In South Asia top fuelwood users are Bangladesh, Bhutan, India, Maldives, Nepal, and Pakistan, accounting to 77 percent to 79 percent of total forest loss in the region, also in the five-year stretch. By region, South Asia, Southeast Asia, and China are the top fuelwood consumers. It would seem unfair to blame housewives—particularly those who toil the land—because generally, women farmers are known links to biological continuity. To dispel such notion, the UNFAO made a study and noted that until 1980, firewood demand was a minor cause of deforestation. Women and children were collecting and using mostly branches and twigs while leaving trees standing. But after that decade, due to rapid population growth in the rural areas, trees, big and young, started to be cut purely for fuelwood. Often, young trees were the first to be cut, including those in reforested reservations and sanctuaries, UNFAO reported. When the small trees were consumed, fuelwood gatherers de-branch bigger trees causing many to die. Eventually, when the big trees dry and die, they are cut, UNFAO concluded. The deplorable predicament worsens deforestation, and further aggravated by farmers clearing lands for livestock and crops. To this day, forests are fair game as forest fragments crumble to almost daily cutting and gathering for fuelwood. While not quite deforesting the globe, these problems are undermining the well-being of hundreds of millions of people in at least two continents—Asia and Africa. Fuelwood consumption exerts pressure on the resource base if it is increasing at a rate higher than the growth of trees. Most rural folks in poorer Third World countries cook over open fires. The most common is the “three-stone fire,” the fire set between three stones bricks or whatever to support the cooking pot. But this open fire system is wasteful and inefficient. As more wood is burned and wasted, more fuelwood is gathered, more trees cut, more forests ravaged. To employ measures to improve fuel efficiency, there is a need to sustain a campaign for more efficient rural stoves. Traditional stoves used inside rural homes have to be replaced by more energy-efficient stoves that don’t soot homes and cause upper respiratory ailments to family members. THE UNFAO’s Fuelwood Program said 43 percent of the Philippine rural population depend on fuelwood for energy but is seldom using other forms of biomass like plant matter and animal wastes. Until recently, most biomass consumers lived in rural areas. As populations have grown, and the number of trees has decreased, searching for fuelwood has indeed become a demanding task. In the Cordillera Administrative Region, the Cordillera Ecological Center (CEC) has developed an alternative fuel for cooking from the oil of native tree Pittosporum resineferum. CEC developed this as the region’s fuelwood supply for rural homes in all six provinces has become so scarce. It is becoming scarcer every day. Creeping deforestation has left many towns with less than 30-percent forest cover. “The rate of deforestation is much faster than reforestation efforts. In many places, there is no deforestation to speak of,” said Dobbels Wallang CEC’s environmental specialist. To many farmers, collecting firewood was a two-hour task 50 years ago. Today, it is almost an entire day expedition—every day. “There are less and less dead trees and branches to cut,” Wallang added. “You are lucky if you can bring home a body-load after a day’s hunt,” he added. Because of the seriousness of the problem, the CEC is going around the rural areas training farmers on tree raising and tree planting by turning vacant spaces into woodlots. The project calls for planting fast-growing nitrogen-fixing and multi-use tree species that yield branches fast and cut for firewood. These include Pinus kesiya, Alnus japonica, Flemingia macrophylla and Calliandra calothyrsus. More than a hundred woodlots have been established in at least six towns that continuously supply fuel needs of rural homes. CEC raises yearly thousands of trees that are distributed to farmers groups, schools and civic organizations that help in reforestation efforts through community-based approaches. In the Cordillera region, indigenous forestry practices are being popularized to answer the shortage of fuelwood, such as the muyung or pinugo, lakon or batangan, tayan, and lapat. These are traditionally inherited woodlot properties and are privately owned that serve as primary sources of fuelwood, construction materials, food, and medicines. They are storehouses of flora, containing from 100 to 264 tree and plant species, mainly indigenous, and endemic in the region, 90 percent of which are useful. MIRI: The Sarawak Fire and Rescue Department in Miri has intensified aerial water-bombing operations to contain a raging forest fire in Kuala Baram district. The fire has also worsened the haze, recording an Air Pollutant Index (API) level at 113 on Sunday (Aug 19) morning. A reading of 0-50 is considered good, 51-100 moderate and 101-200 unhealthy. Miri Fire chief Supt Law Poh Kiong said the Bomba air unit will be dropping more water to control the flames from spreading. “Yesterday, we carried out 70 rounds of aerial water-bombings. “This morning, we did more rounds,” he said. Fire-fighters are also on the ground battling the flames on peat soils. The wildfire in Kuala Baram is one of the dozens that are burning throughout the state. Authorities are also worried about the haze and smog coming from West Kalimantan. There are already more than 120 huge fires raging in the area. Those fires measuring one sq km in size are called hotspots as they can be detected by satellites even 100km above earth. The number of hot spots in the Indonesian province of Riau went down to 27 yesterday from 121 a day earlier with the authorities stepping up measures to fight forest and peatland fires, including a shoot-on-sight order issued by the military against firestarters. Mr. Jim Gafur, head of emergency response at the Riau disaster management agency (BPBD), told The Straits Times yesterday that fire-fighting teams had succeeded in dousing and containing the fires. He said the worst-affected areas were north of Pekanbaru, the provincial capital, Bengkalis, Dumai, and Rokan Hilir. Winds, which have become stronger in Sumatra as a result of tropical storm Bebinca in the South China Sea, have moved north-east. At this time of the year, they usually blow north until November or December before turning south-west, Mr. Jim said. “Prevailing winds over the northern part of the ASEAN region are forecast to continue blowing from the south-west or west (towards north-east and east), and may strengthen briefly over the next few days under the influence of the (Bebinca) storm,” the Meteorological Service Singapore posted on its website yesterday afternoon. It added that it was continuing to observe smoke haze from hot spots in Riau and Kalimantan. Mr. Jim ruled out any possibility of haze moving south towards Palembang, which is co-hosting the 18th Asian Games. No hot spots have been detected in Palembang or South Sumatra so far. “We are intensifying water bombings. We have been deploying five helicopters, two of which are bigger ones that are able to carry 5,000 liters on each trip. Ground firefighting efforts have also been intensified,” Mr. Jim said. Commander of the Riau Land and Forest Fire Task Force Sonny Aprianto issued a shoot-on-sight order across Riau on Thursday against those caught red-handed clearing land by burning, state news agency Antara reported. “Ninety-nine percent of the land and forest fires in Riau province are related to the intentional acts of irresponsible people,” Antara news agency quoted Brigadier-General Sonny as saying. He also said that the authorities have not had much success in convincing people not to clear land by burning, acknowledging instead that the slash-and-burn method has become more widespread. Several arsonists have been nabbed, he said, with at least three cases in Dumai city now ready for trial. Satellites identified 121 hot spots in the province on Thursday morning – a big jump from the 22 detected on Wednesday afternoon, said the Meteorology, Climatology and Geophysics Agency (BMKG). The military on Thursday also began deploying troops to fire-prone areas in the province, reported Riauterkini.com news portal. President Joko Widodo and other senior leaders have ordered intensified efforts to combat the land fires to ensure that the Asian Games, which opens today, will not be disrupted. The city of Palembang, in South Sumatra province, is co-hosting the quadrennial games with the capital Jakarta till Sept 2. KUALA LUMPUR • The haze returned to parts of Malaysia yesterday, affecting the west coast states of Perlis, Kedah, and Penang on the peninsula, and Sarawak in East Malaysia. The risk of it reaching Singapore is currently low, as the winds are blowing the haze away from it, but “should the direction of the winds change and blow the haze towards Singapore, we may occasionally experience slightly hazy conditions”, said a spokesman for the National Environment Agency. 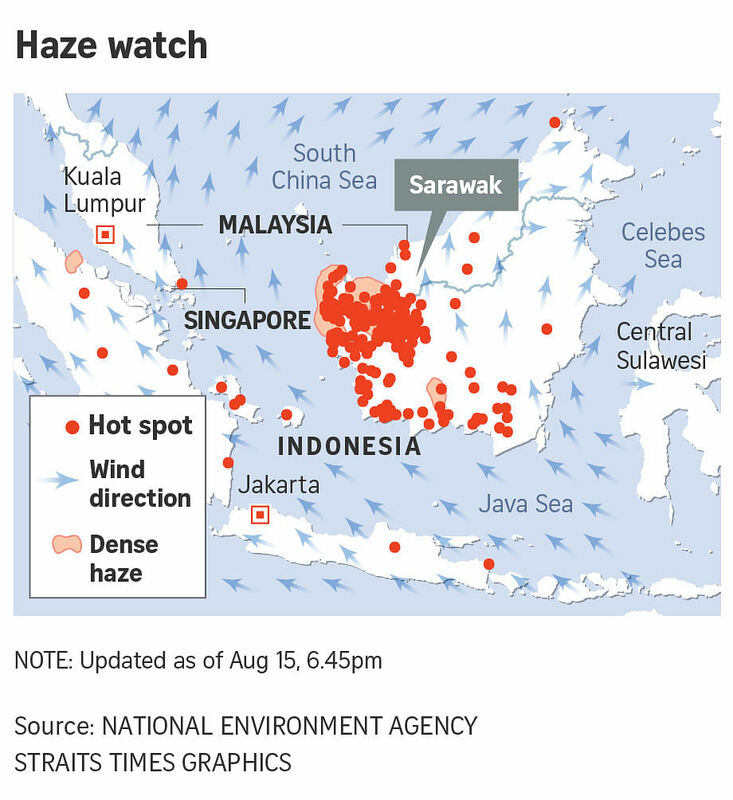 Meanwhile, the haze in Sarawak has been blamed on open burning in the state and the rising number of hot spots in neighboring Kalimantan, Indonesia. State Natural Resources and Environment Board controller Peter Sawal said 121 hot spots were detected across the Sarawak border with Indonesia on Tuesday, more than double from the day before. 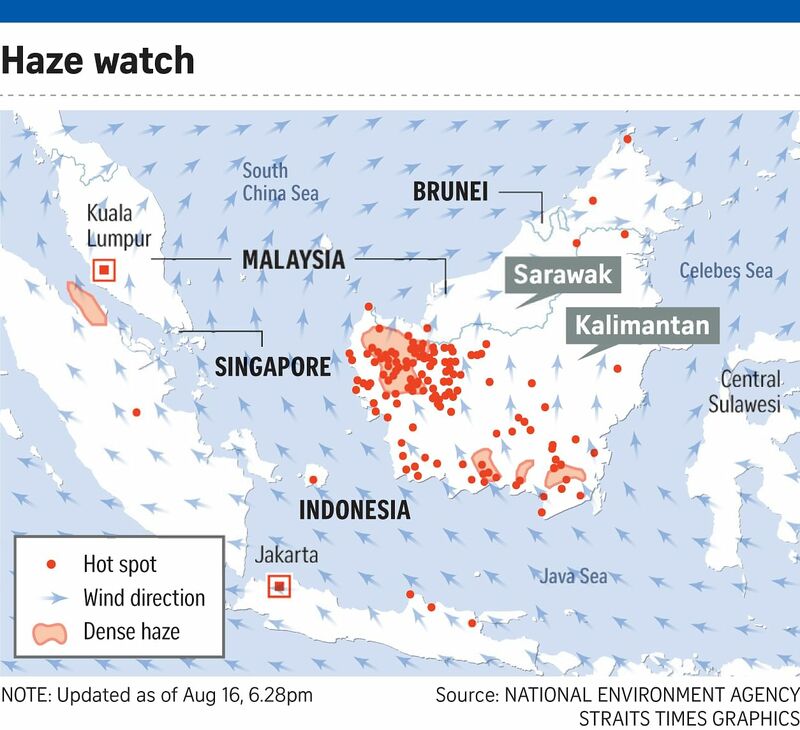 Seven hot spots were also detected in Sarawak. As at 2 pm on Wednesday, nine areas in the state recorded moderate API readings, with Mukah recording the highest reading at 84. The other affected areas were Sibu, Bintulu, Samalaju, Kuching, Kapit, Samarahan, Sarikei and Sri Aman. Mr. Sawal said the hazy conditions could last until the end of the month if there are no changes in the prevailing dry weather and wind direction. Malaysia’s Minister of Energy, Technology, Science, Climate Change and Environment Yeo Bee Yin said she has asked the Department of Environment (DOE) to improve enforcement to put an end to open burning in the country. “Only two or three weeks ago, I realized that the DOE doesn’t even have cars to conduct enforcement,” she said in an interview on Wednesday. “I am shifting resources from the ministry to DOE to perform their jobs,” she added. Ms. Yeo said she has also asked for help from local councils and other agencies to investigate cases of open burning – traditionally used by farmers to clear land. The minister said the current penalty for open burning – a fine of up to RM500,000 (S$167,980), imprisonment for up to five years, or both – was “high enough”. “My gratitude and respect to the armed forces, police, local governments and residents that gave high dedication in preventing and fighting the threats of the forest fire,” he said. KUCHING (THE STAR/ASIA NEWS NETWORK) – The haze has returned to parts of Sarawak due to the rising number of hotspots in Kalimantan and open burning in the Malaysian state. State Natural Resources and Environment Board (NREB) controller Peter Sawal said 121 hotspots were detected across the border with Indonesia on Tuesday (Aug 14), more than double from the day before. Seven hotspots were also detected in Sarawak – two in Kuching, three in Mukah and one each in Sarikei and Sri Aman. As at 2 pm on Wednesday, nine areas in the state recorded moderate air pollutant index (API) readings, with the town of Mukah having the highest at 84. This was followed by Sibu (75), Bintulu (71), Samalaju (61), Kuching (58), Kapit (56), Samarahan (53), Sarikei (53) and Sri Aman (51). A reading of 0-50 is considered good, 51-100 moderate and 101-200 unhealthy. Mr. Sawal said the hazy conditions could last until the end of the month if there were no changes in the prevailing dry weather and wind direction. “From the briefing by the Meteorological Department, we’re expecting this month to be dry with below normal rainfall. “But things may change; we may experience intermittent rain, and that will dampen the weather. However, we also monitor the situation because of the high number of hotspots detected across the border and the winds blowing towards us,” he said. Mr. Sawal said a few incidents of local burning by farmers had been detected in Sibu, Mukah, Sri Aman and Betong. “Our men on the ground are now advising local farmers to be vigilant in controlling and monitoring their burning to prevent it from spreading,” he said. He also said the NREB had stopped issuing permits for open burning to plantation companies since July and would take action against any illegal burning activities. Offenders could be fined RM30,000 (S$10,000) or prosecuted in court. However, Mr. Sawal said better awareness and enforcement has resulted in a reduced number of illegal burning cases. “For the past few years, our records show that incidents of illegal burning had reduced. I think they are aware of the seriousness of illegal open burning. In Miri, firemen were battling several wildfires in the towns of Mukah, Bintulu, and Bintangor. Wildfires over about 4ha of land have been burning since Tuesday evening in Kampung Assykirin in Bintulu. In Mukah, peat fires in Daro are being tackled, while in Bintangor, wildfires have been contained at 24.3ha of the Felcra Bunut plantations.